In addition to search, Google+ has a very deep relationship with Contacts. That shows especially in services, such as Gmail, that use contacts heavily. In many ways, Google+ is quickly becoming a customer relationship management (CRM) tool. You can manage your contacts and track your communication with people you associate with inside Google products (and possibly, eventually, elsewhere). 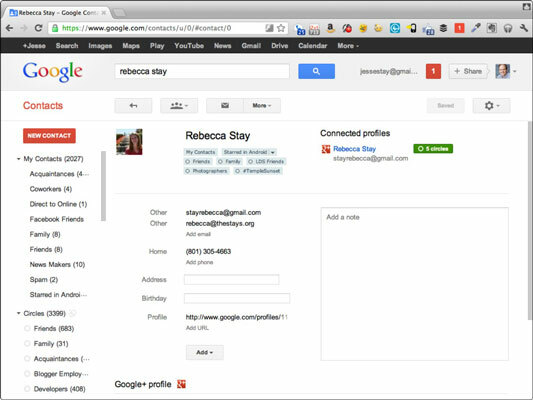 Gmail shows profile information for contacts you communicate with as you read their e-mail. When you open an e-mail from a Google+ user, that person’s information from Google+ appears in the upper-right column. If you click More, you can see your most recent communication with that individual. If you haven’t added the person to any circles, you can do so from inside the Gmail web interface. 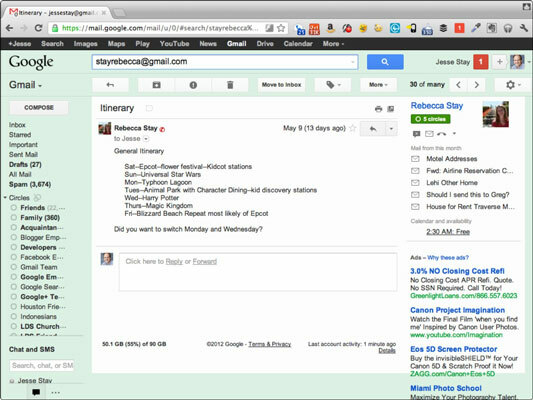 Gmail search lets you look for e-mail from people in your Google+ circles. Search right inside Gmail and include circles:family or circles:friends, followed by your search criteria. For example, to search for kittens in your family circle, type circles:family kittens. In return you get all the e-mail you received from those circles, with your search criteria. Gmail lets you click circles to access e-mail from Contacts in those circles. Click to expand the Circles link in the left column. Then click the name of any of your circles. People you add to circles on Google+ are also added to your contacts. Now, when you visit Google contacts, you’ll see the circles that each contact is in. The circle appears next to the contact’s name. In addition, if that person’s profile lists any contact information publicly — or is in the circles you’re in, you’ll have that user’s information in your contact profile. This is one more reason to add a phone number or e-mail address in your own Google profile. Google Voice allows you to set phone settings for the contacts in each of your circles. When you go into your Google Voice settings, a Groups and Circles tab lets you decide how calls are handled for each circle you’ve created. Because of Google+, your groups are automatically created for you.